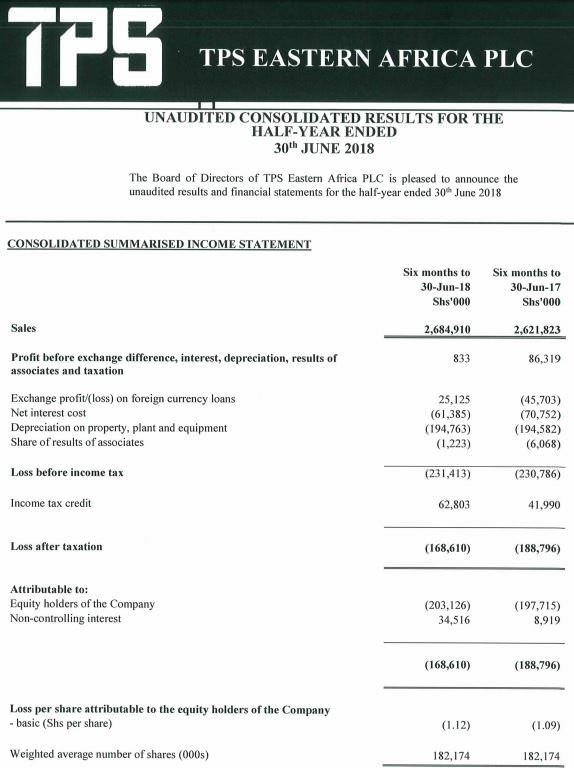 TPS East Africa, owner of the Serena hotels brand, cut its half-year net loss by 10.7% to Sh168.61 million in the period ended June 30th. Revenues increased by 2.3% to Sh2.68bn in the six months. The firm said the first phase of the Nairobi Serena Hotel redevelopment will be handed over this month and expects it to impact positively on the results in the fourth quarter. 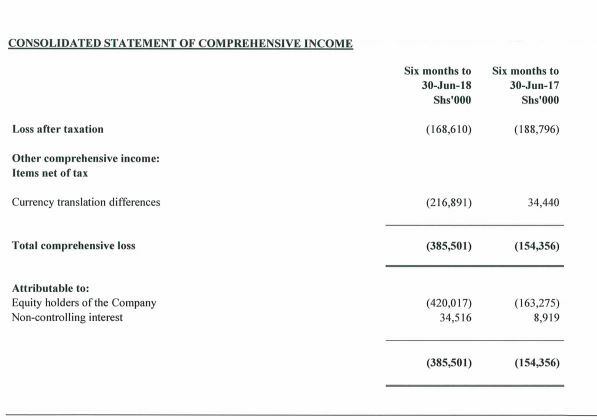 Serena Hotels has posted a loss of Sh168 million in the first half of 2018, a reduction of the Sh188 million it posted same period in 2017. Serena attributes the loss to lower than expected sales from the foreign leisure tourism arrivals in Kenya during the first quarter and the unexpected increase in energy and other operating costs. Going forward, the management is optimistic about the second half of 2018 due to direct flights by Kenya Airways from Nairobi to New York from October, resumption of Air France flights to Nairobi and granting of additional flight frequency of Ethiopian airlines to Mombasa from last month. “Based on the feedback received from our supplier of Business in traditional and new international source markets, there is increased interest in selling destination East Africa. Current forecasts indicate satisfactory outlook during the second half of 2018 for Serena Kenya, Serena Tanzania and Serena Uganda,” Management said. Sales went up marginally to Sh2.68 billion from Sh2.62 billion in 2017. Rather disappointing. I understand that the Serena Nairobi is suffering but the hurt is real across the board. Serena Hotel is gearing up for expansion into the populous Democratic Republic of Congo (DRC). According to Managing Director, Mr Mahmud Janmohamed in an interview with The Standard, they have identified a hotel in the mining town of Goma where they will be assuming management roles later in the month of July, 2019. ''We are expanding our footprint into DRC. It is a management contract,'' the MD said. Serena Kivu is just across the border in Rwanda. That area is very volatile but they should charge the mining companies premium rates to recover investment quickly. Management contract. Why would one stay in Goma when (safer) Gisenyi is just a few miles away? It's sad what's been happening in DRC/Zaire over the years/decades. I wish the people of DRC well. TPSEA is going to run the hotel which is better than owning assets in DRC. KK bailed out of DRC after building a new storage facility. Too much drama. Good days await. Serena Nairobi renovations are almost complete. I have a few shares. I will pass by and have a look. When are FY results expected? Spending a few days at a Serena property later in the year. I plan to pass by for a cup of tea by the end of the month. Investigate whether they will be ready for the peak season tbis year. I plan to pass by for a cup of tea by the end of the month. Investigate whether they will be ready for the peak season this year. Passed by TPS Nairobi, had some tea there. New wing and parking complete. They are now renovating the old rooms. Baba really likes the place, he was hanging out there. The question is whether shareholders will make money from investing in this one. I doubt they will...at least not value investors.